John Travolta and Queen Latifah have signed on to star in New Line Cinema's upcoming feature film adaptation of the hit Broadway musical "Hairspray," it was announced today by Toby Emmerich, New Line's President of Production. Travolta will play Edna Turnblad and Queen Latifah will play Motormouth Maybelle in the film, which is being directed by Adam Shankman ("The Pacifier," "Bringing Down the House") and produced by Craig Zadan and Neil Meron, for their Zadan/Meron Productions, who previously executive produced the Golden Globe and Academy Award-winning Best Picture "Chicago." A nationwide casting search is currently under way to find a newcomer to play the lead role of Tracy Turnblad in the film, with production on "Hairspray" scheduled to begin this Fall for a potential Summer 2007 release. "From cult classic film to hit Broadway musical to major motion picture, "Hairspray" is a true New Line franchise," commented Bob Shaye and Michael Lynne, New Line Co-Chairmen and Co-CEOs. "John and Queen Latifah will bring new sensibilities to the characters of Edna Turnblad and Motormouth Maybelle, and introduce this innovative musical comedy to new audiences." Zadan and Meron said: "It's long been a desire of ours to work with John Travolta and to have the opportunity to produce his return to movie musicals after three decades... it's a dream come true. And having worked so successfully with Queen Latifah on "Chicago," we were looking for the perfect vehicle to re-team... "Hairspray" presented us with a wonderful opportunity to collaborate once again with our multi-talented friend." "Hairspray" is originally based on the 1988 John Waters comedy about star-struck teenagers on a local Baltimore dance show. The new version of the film will be based on New Line's hit Broadway adaptation of the film, which debuted in 2002, and went on to win eight Tony Awards including Best Musical, Best Score, Best Book and Best Director. Marc Shaiman ("Sleepless in Seattle") and Scott Wittman will contribute new songs to their existing Tony Award winning score. Shaiman will also serve as the film's music supervisor and will compose the music score for the film as well as produce its songs. Wittman and Shaiman will also serve as executive producers on the film. 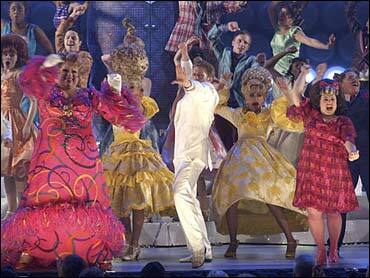 The new screenplay for "Hairspray" is written by Leslie Dixon ("Freaky Friday," "Outrageous Fortune"). Emmerich is overseeing the project along with New Line's Executive VP of Production Mark Kaufman, and Creative Executives Michael Disco and Daryl Freimark. Travolta burst into the dance musical world thirty years ago with "Saturday Night Fever" and packed a one-two punch the following year with the release of "Grease," the most successful movie musical of all time. Travolta was nominated for Oscars for "Fever" and "Pulp Fiction." He is represented by the William Morris Agency and attorneys Mike Ossi and Howard Butler. "Hairspray" reunites Latifah with producers Zadan and Meron (she earned an Oscar and Golden Globe nomination for her work in "Chicago") and director Shankman (she starred in his blockbuster "Bringing Down The House"). Latifah is also represented by the William Morris Agency. Founded almost 40 years ago, New Line Cinema is the most successful independent film company in the world. Its mission is to produce innovative, popular and profitable entertainment in the best creative environment. In addition to the production, marketing and distribution of theatrical motion pictures, the fully integrated studio has divisions devoted to home entertainment, television, music, theater, merchandising and an international unit. In 2005, New Line partnered with HBO to form Picturehouse, a new theatrical distribution company to release independent films. A pioneer in franchise filmmaking, New Line's Oscar-winning "The Lord of the Rings" trilogy is one of the most successful film franchises in history. New Line is a division of Time Warner, inc. (TWX).